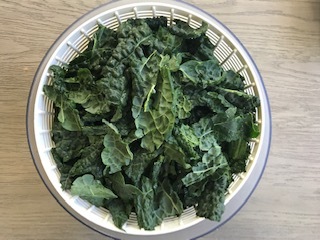 Roasting kale, as in this recipe, makes a wonderful side dish, complement to fish or meat and even a tasty snack. 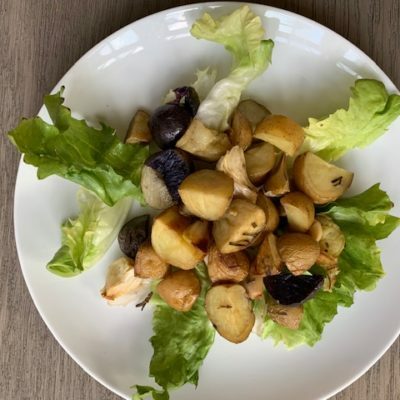 You can complete all the steps many hours before your meal and then just pop it into the oven 30 minutes before serving. 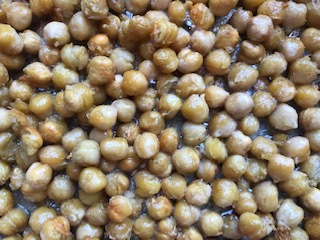 The chick peas can also be cooked in advanced, and then tossed into kale when ready to serve. 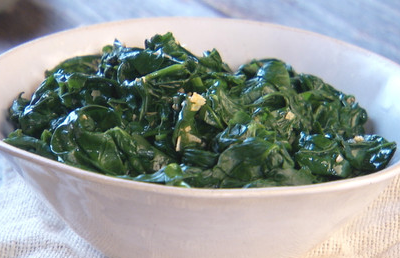 I like this recipe because it takes most of the work out of preparing kale since you just have to cook it in the oven. 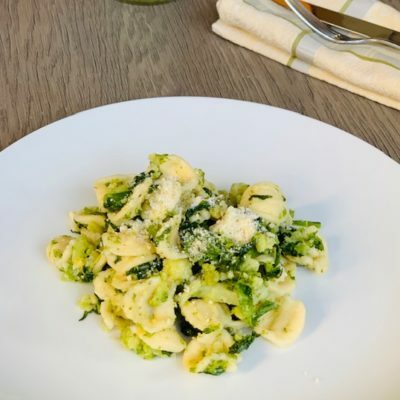 Lacinato kale is also known as Italian kale or cavolo nero and the cruciferous vegetable has been used in dishes for thousands of years. Kale is best grown in cooler climates which makes it most commonly available in the fall and winter season. 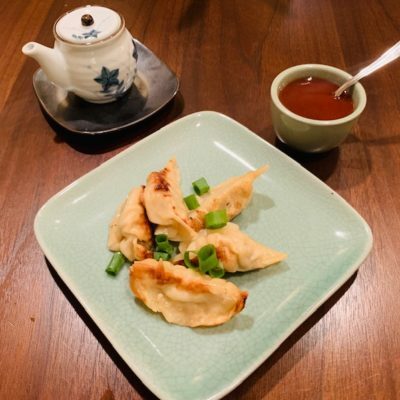 It seems to be the “green” of the moment with many versions popping up on restaurant menus. The Scots use the expression “come to kale” as a way to call someone to supper (dinner). Preheat oven to 325F (165C). 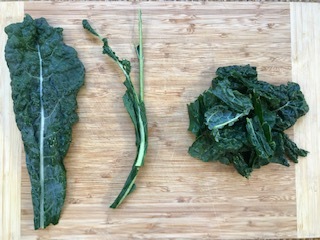 Remove the large center rib from the kale with a knife and then cut kale into 2 inch pieces, or larger depending on your preference. Clean well- I use a salad spinner. In a large bowl, place the kale and add 3 tablespoons of the olive oil and salt. Blend together well and season to taste. 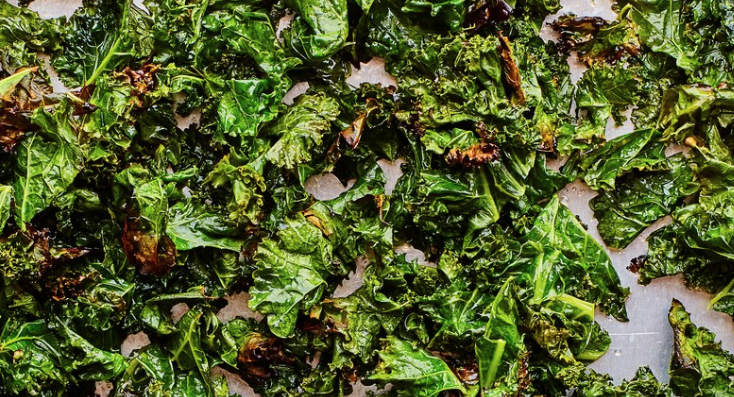 Place kale on a large baking sheet and place in oven. Cook for 10 to 15 minutes, mix the leaves to assure more even cooking and cook for another 10 to 15 minutes. Remove from oven, kale will be crispy with a nice textural crunch. While kale is in oven, drain and rinse the chick peas. In a medium saute pan, add two tablespoons olive oil and gently heat. 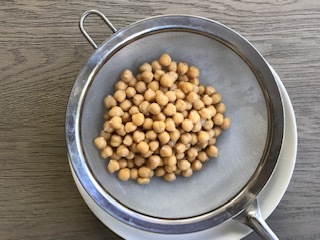 Add chick peas to the olive oil and cook until the chick peas begin to shrink in size and turn a nice, toasty brown color. It takes about 15 minutes. Remove chick peas from heat, add the roasted kale to a large bowl and pour in the chick peas. Mix and season to taste. Add the chili flakes if desired and a nice drizzle of olive oil. 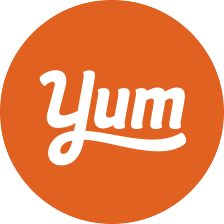 Place mixture on individual plates with protein or serve family style in a large serving dish.